De onderstaande tekst is geschreven in 1995! DM '90 - The New Diesel Multiple Unit for Netherlands Railways (NS). With the development and design of the DM '90 diesel multiple units, a new standard has been created. The DM '90 units are faster, roomier and more comfortable than the older diesel-powered trains. Although the DM '90 incorporates new technical features, especially in the control equipment, extensive use has been made of the experience gained with known systems (especially the SM 90 and DH) as regards product reliability and project implementation. DUEWAG AG, a subsidiary of Siemens, will hand over the first train to Netherlands Railways (NS) in Februari 1996. At the end of May, trial operations will be started on the Arnhelm (sic) - Winterswijk - Roermond route and, later, normal service on the other diesel routes. The last unit is to be handed over in the course of 1998, thus finalizing replacement of the type DE-II and DE-III multiple units. The routes in the north and east of the NS network are operated with diesel multiple units (DMUs) - in the north with diesel-hydraulic trains called "" (DH I, 19 cars and DH II, 62 cars) and in the east with diesel-electric trains types DE II (25 cars) and DE III (123 cars). Most of the diesel-electric multiple units from the fifties and sixties have to be replaced within a few years. With this in mind, NS Materieel Engineering in conjunction with NS Reizigers (NS Operations) drew up the specifications for a new, comfortable multiple unit with the name DM '90. Construction of a new range of units based on the existing trains built by the DUEWAG company in Krefeld-Uerdingen. The new DMUs would have a longer carbody, a higher top speed and a comfortable interior. Construction of a new range of vehicles based on the electric "Railhopper" train (SM '90) which was being developed and built by the wagon factory Talbot, Aachen, at that time. Renovation of the old DE III trains. Construction of a new range of vehicles based on existing designs for other railway administrations, such as British Rail and German Rail. The Railhopper idea proved to be the best, both as regards functionality and life-cycle costs. When the specifications were being drawn up, the power-transmission aspect was evaluated. Diesel-electric or diesel-hydraulic? Six electric and hydraulic versions in all were considerated: with one or two diesel engines for each two-car unit, with one or two powered bogies, and even with individual axle drive for each car. The initial selection was made on the basis of the following criteria: the cost of the investment, maintenance and fuel costs, reliability, running performance, sensitivity to smooth rails, the environment and development risks. The conclusions of this study were insufficient to make a decision regaring profitability. For this reason, both types of drive were included in the specifications and the NS obtained prices for both versions from the industry. The specified DE version was directly derived from the modern SM '90 vehicle with inverters and three-phase engines. In this version, the DM '90 was to be fitted with a single inverter and an SM&nnsp;'90 powered bogie. Both cars were to be equiped with a diesel-engine/generator combination. The specified DH version was directly derived from the existing trains. A diesel engine is fitted beneath each car and, via hydraulic gears, drives the two axes which are coupled in a bogie. The two leading bogies are non-powered bogies, while the two bogies at the concertina ends are powered. NS finally decided in favour of the DH drive system on the basis of the tenders made by two different main suppliers and two different suppliers of the electrical equipment. Although the DE drive system was more attractive in some aspects (maintenance costs and fuel consumption), the lower cost of investment was te most important reason for choosing the DH version. On the basis of the research results and tenders from DUEWAG, SIG, Holec and other suppliers, NS Materieel Engineering finally worked out the technical approach to the DM '90. 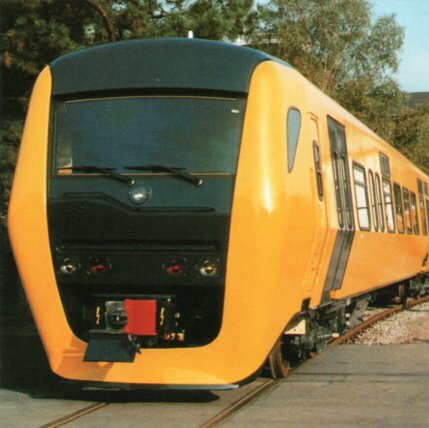 This approach was taken further to produce an actual multiple unit design under the project leadership of NS Materieel Engineering and in consultation with DUEWAG, the main supplier, as well as Holec, who were to supply the electronics. All the while this was being done, the changing requirements and wishes of the NS market were continuously taken into account. The colour design of the interior and exterior walls, for example, were changed in a later design stage and, in the train, a multi-functional room for coffee, drinks or sweet vending machines was created. 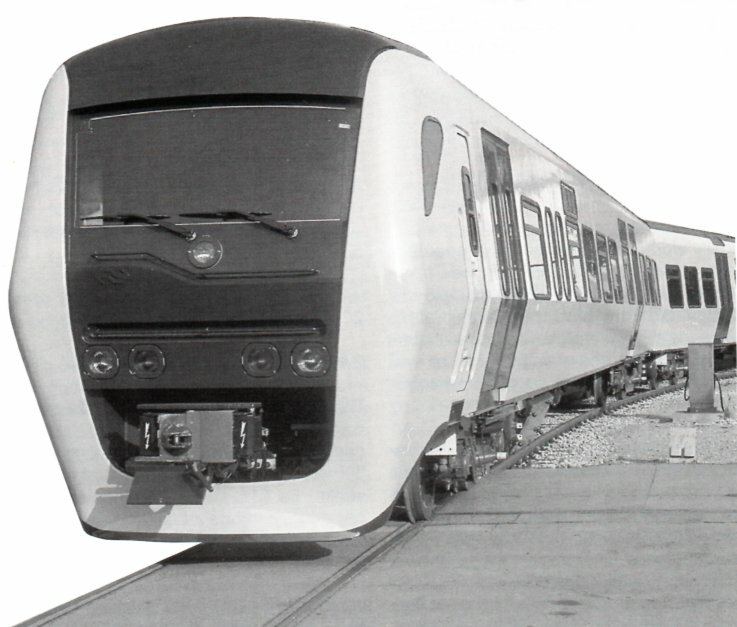 During development of the DM '90 train, individual car drive was also considered. The DH version is especially suitable here as this unit has two independent sets of machines. During development of the SM '90 train, NS Materieel Engineering, in consultation with the owner/user of the rolling stock (NS Reizigers), selected a train control system which combined simple operation with maximym facilities. For the train personnel, it is no longer necessary to switch on or off all kinds of systems depending on the different circumstances. Selecting an operating state is enough in order to be able to use the system or at least up to a certain level. 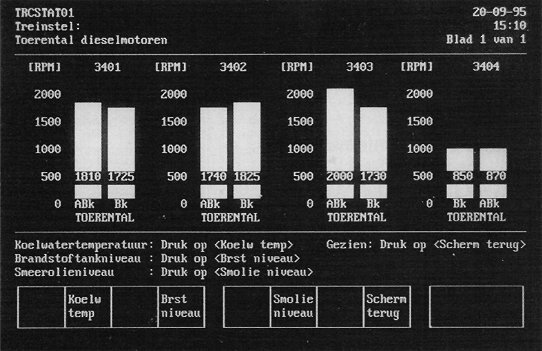 For example, "Drive" during the operating mode "Clean" is not enabled but "Heating and Ventilation" is, albeit up to a lower level than during the operating status "Capable of Service". Other operating states are "Slumber", during which nearly all systems are deactivated, and "Ready", during which all systems except for "Drive"'are given clearance (see section 5). The carbody developed by Talbot - a partner of DUEWAG - and made of welded steel sections mainly consists of Fe 360 steel and, for parts subjected to more stress, Fe 510 steel. The floor and roof panelling is made of alloyed high-grade steel 1.4003 so that higher resistance to corrosion is ensured. In order to minimize the consequences of collisions, a tripcock is integrated in the vehicle head to prevent people or other vehicles in the accident from being squashed, pulled under or driven over. The front sections are specially equipped with energy-absorbing zones between the driver's cab and the boarding area. This enable any crashes to be absorbed to a certain level. The driver's cab is a specially designed survival space. The two-car DMU has a total length over couplers of 52,340 mm and a maximum width of 3200 mm. This width allows different seating arrangements with four or five seats per row (Fig. 2). For the DM '90 however, the version with four seats per row was chosen. This is also based on the table of data. The exterior double-hinged doors with a clear width of 1300 mm permit easy access to the generous boarding and multi-purpose areas. The carbodys (sic) manufactered and painted by Talbot are delivered to DUEWAG in convoy with the floor already mounted and the exterior doors and windows already built in. There, the interior is completed and the drive system developed by DUEWAG is fitted. Commissioning is then also completed. The DM&nsbp;'90 diesel multiple unit consists of a Bk-type car and an ABk-type car. The Bk car has a large area with seccond-class seats, a conductor's room and a multi-purpose room for transporting bulky objects, such as bicycled or perambulators. In addition, the Bk car can be fitted with drinks vending machines if required. The ABk car has first- and second-class seats, a wheelchair space in the compartment, a toilet and a multi-purpose space in the boarding area. The ABk car is pre-equipped for building in a wheelchair lift. Sound installation is mainly provided by optimum design of the generator-unit suspension and a floating floor structure. In order to reduce emission of structureborne noise which is not only caused by the machinery but also by the rolling noise, all interior surfaces of the carbody are covered with noise-deadening material. For purpose of heat insulation, the whole carbody is cladded with insulation mats between the actual surface and the interior panelling. The interior walls have a modular structure and consists of glassfibre re-inforced plastic. The floor is 1160 mm above the top of the rail and has a continuos (sic) linoleum covering wich forms a tight-fitting and hard-waring surface. In the version with 4 seats per row, the attractive interior has very comfortable seating which is mainly arranged face-to-face. The seat module is 1800 mm long, thus making the seat spacing 900 mm. The large multi-purpose area is fitted at the sides with folding seats and attachment points for drinks machines. The door systems used y the NS at the present are electropneumatically-operated double-hinged doors. 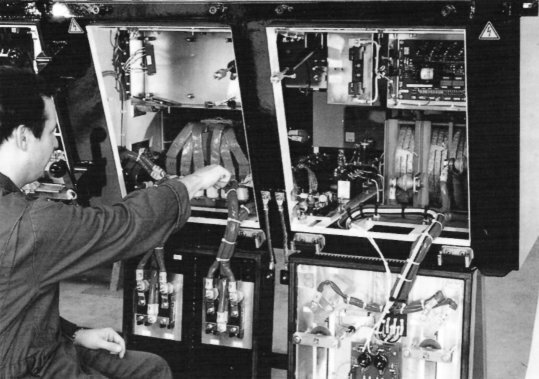 The Dutch company, Transferia Tebel, developed a door control system for the SM '90 project whereby some of the electro-pneumatic components were replaced by a microcomputer (PLC). This PLC meters the amount of compressed air during opening and closing so that the door moves smoothly and at a uniform speed. As a result, the time spent on adjusting the doors has been considerably reduced as small deviations are corrected by a feedback control. The PLC has a diagnostic function which allows any defects to be quickly located. Both cars of the DM '90 DMU are equipped with diesel-hydraulic drive systems designed by DUEWAG. The Cummins NTA 855 R4 diesel engine (6-cylinder in-line engine, supercharged, water-cooled, 320 kW at 2000 rpm) has a low overall height due to its cylinder arrangement. When fitted below floor, the prescribed floor height (1160 mm above t.o.r.) can still be complied with. On its output end, the engine is connected friction-locked and form-fitted to an engine mounting which is specially matched to the engine housing. The auxiliary-output end is supported by a slim and flexible mounting. Both engine moutings are connected to the carbody by rubber fluidfilm bearings. At these points, beams have been integrated in the car structure for better power initiation. A short articulated shaft connects the diesel engine to the hydrodynamic gearing (Voith T211 rzze). Up to a speed of approximately 97 km/h, the gears work in the highest acceleration step within the converter range. At higher speeds, the drive output is transmitted by a hydraulic clutch in order to save fuel (higher gear efficiency). Another articulated shaft connects the gearing to the axle drives (manufactured by Flender). The drive output is transmitted via a cardan shaft to both axles of the powered bogie supplied by SIG. Ont its auxiliary output end, the diesel engine is connected to a hydrostatic pump via an articulated shaft. The pump is necessary for driving the hydristatic motors for the auxiliary machines such as the generator and the cooler fan. The cooling system used in the DM '90 is designed for cooling the diesel engine, the gears and the hydrostatic system. The heat absorbed by the oil circuits for the gears and hydrostatic system is transmitted to the engine cooling water in a double heat exchanger. The heat in the cooling water is given off to the surrounding air via a cooler with a thermostatically controlled fan. The DM '90 bogies have been selected by NS Materieel Engineering and ordered from SIG in Switzerland. These bogies are directly derived from the non-powered bogies of the IRM project and adapted to allow fitting of the two unsprung axle drives from the Flender company and the connececting cardan shaft. The connection to the carbody is very simple: apart from the pneumatic and electrical connections, there are only four screwed connections. The electrical system is being developed and supplied by Holec Ridderkerk and will be installed by Holec Projects. The electrical energy is produced by a completely closed three-phase generator for each car. It supplies 400 V 50 Hz 3 F+N with an output power of 44 kVA. The generator is driven by a hydraulic motor which is fed by a hydrostatic pump connected to the traction diesel engine. During normal operation, the two three-phase systems of a DMU are separated. If, however, a generator or its drive unit fails, the two systems are automatically connected so that all vital functions are maintained. Non-priority loads are switched off. An electronic transformer is built into both cars which converts 400 V three-phase current into 24 V direct current. The converter in the ABK car (600 W) is only used for charging the starter batteries from which the starter motor and the magnetic track brakes are supplied with power. The (series-resonant) transformer in the Bk car (11 kW) charges the main battery of the 24 V system. This battery feeds the starter motor and the electromagnetic track brakes of the Bk car as well as all 24 V loads. The DM '90 units are equipped with 24 V so they can coupled to older existing which have a 24 V system. When the 24 V system was being designed, special attention was paid to the voltage loss and selectivity of the protective circuits. In addition to the 24 V system, there is a modest 110 V system (not backed up by a battery) for supplying power to loads which have to be exchangeable with the equipment used in the SM 90 or the IRM. The heart of the train control system is the HOVIS (Holec Vehicle Information System) developed by Holec Ridderkerk. HOVIS designated the whole system of hardware and software which make up the train bus and applications. The functions can be combined in different ways. For DM '90, all functions have been implemented. The control function covers a number of subsystems such as drive, the low-voltage system, ATC, the brakes etc. The HOVIS has not been specially developed for the DM '90. It is a universal system which is used in electric-powered railway vehicles of different kinds and is tailored to the particular application in each case. Fig. 5: Structure of the communications equipment and interface with application programs in the VICS-PLCs. The MMI is in the form of a monitor (Fig. 6) and a keyboard in the driver's console. The programmable software enables the driver to display a large number of screens and carry out many operations. Great value was placed on having a logical structure for the data presented. 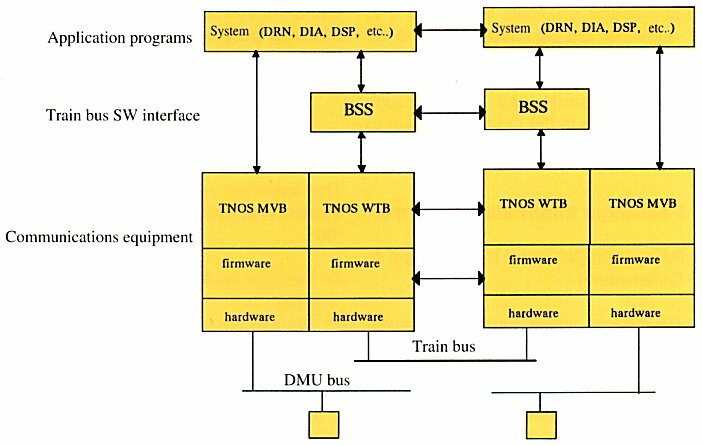 The train network operating system (TNOS) is based on the draft version of IEC standard 332. The BSS software acts as an interface between the subsystems (drive, low-voltage system etc.) and the TNOS. When a DMU is being prepared for service, the control equipment in the occupied cab is appointed as the master. This starts initialization of the bus and allocates an address to each slave detected. At the end of the initialization process, all connected multiple unit trains are memorized by the master in the form of train numbers which are presented to the train driver on the screen. So-called "dead trains" or DH vehicles are also detected. Aftere an alteration to the train configuration, the bus is initialized again. The many possible train configurations and states make this part of control complicated. Nevertheless, Holec has succeeded in incorporating it successfully. The definition of different train states make it possible to activate certain train functions only when they are needed. "Capable of service" (all functions are available). During the operating state "Capable of service", the train driver can use the keyboard and the screen to programme the AOS so that the DMU changes over to the "Clean" or "Ready" state at a desired point of time and the diesel engines are started if necessary. With the help of the available input signals, the AOS independently decides wether the train has to be switched over to "Re-charge". As a result of interfacing the control equipment for the different systems on the vehicle bus, all information about the state of these system components is available in the VICS. The train bus is able to pass on this information to the VICS in the occupied cab, which displays the data on the monitor at the request of the driver. A technician can also call these data or measured values. It can be seen at a glance, for example, wether all doors of the train are closed and, if not, where a fault has occurred. During monitoring, measures (sic) values are displayed. Alarms go a step further. If a measured value is above or below a critical limit, an alarm is generated which is reported to the train driver. An example is when the maximum temperature of the diesel-engine cooling water is exceeded. Holec Ridderkerk has fitted the DM"'90 with an exceptionally intelligent diagnostics system. This is a continuation of the system which is already being used in the IRM double-decker car and was developed in conjunction with the NS. It can be assumed that this "doctor" is present at all times. The HOVIS diagnostics system is actually a model-based expert system. The model loaded in the VICS-PLC is continually fed with the measured values made available by the monitoring function. The result of the model is compared with the actual information. The diagnostics system is able to draw up a list of devices which are the causes of the deviant behaviour. This list is drawn up in order of devices with increasing MTFB. Depending on the persons addressed (driver or maintenance personnel), the action to be taken is shown on the screen. This leads to quick fault rectification so that the availability of the DM '90 DMUs is enhanced. Recording is implemented for each DMU so that the history of the faults occurring in a train remain stored in the memory. Finally, it is possible to read the recorded data into a PC in the workshop. There, the recordings are printed on the work orders used to assign maintenance work to the workshop personnel. This way, the DMU is available for service again as quickly as possible. The heating and ventilation system has been developed by the Hagenuk company. The heating energy for operating the air-heating system is mainly taken from the engine cooling water. In order to ensure that this also functions during pre-heating, the DMU control equipment can start the machines of the DM '90 independently and keep the train idling until the temperature of the cooling water has reached the relevant level. During pre-heating, the thermal energy is mainly taken into the engine cooling circuit and the heating circuit via an electrical 25 kW water-heater. The diesel engine is adjusted so that, during idling, a maximum power of 59 kW can be output for the hydrostatic drive unit of the generator. There is thus enough electric power to operate the water heater. The heat given off by the engine in the process also contributes towards heating up the cooling water. The intake grid for fresh air is above the windows. From there, the air is taken through air-conditioning devices which are located above the ceiling cladding in the boarding areas. The air is then taken through ceiling channels separated into two sections. During ventilation, the air flows into the individual areas via the ceiling. During heating, hot air flows through the ceiling channel and then through branch channels in the side walls down to floor level, where it is exhausted. The PA system serves for the transmission of information to the passengers. In the driver's cabs and in the conductor's rooms, there are intercom stations. For train units made up of several coupled trains, a general PA system is formed via the automatic coupler system. In a two-car DMU, there are 17 loudspeakers altogether. The system is fed with 24 V DC current. The passenger is informed of the final destination by means of a destination board as a supplement to the timetable and the information given at the stations and on the platforms. Two LCD displays are located on the exterior of the DMU so that there is a display on each side of the train. These devices are operated by a central unit (PLC) in the conductor's room. All central units of a train are connected with each other via the train bus. Each central unit has a permanent memory with all stations served by the train. This memory can easily be removed by NS personnel and replaced. The displays can show the text in two lines. The texts are easily readable up to a distance of 7.5 m.
A Knorr screw-type compressor with a delivery rate of 600 l/min supplies the compressed air (10 bar). An air dryer is connected in the system so that corrosion of the air lines is avoided as much as possible. The compressor is fed from the 380 V system by an asynchronous motor. For safety reasons, a conventional air brake control system comes into effect during rapid braking. This system is also available as a back-up system during service braking and during coupled driving with . In new rail vehicles, the NS uses an automatic train control system from the Belgian company, ACEC. This ATC system was developed in close collaboration with NS Railinfrabeheer, Holland Railconsult and NS Materieel Engineering. DM '90 is the first range of vehicles to use the "the new-generation ATC". This system no longer relies on track circuits but on beacons in the track.